The world of vegan cheeses scares me. I’m not sure why. Maybe because cheese is the main reason I feel like I could never become a proper vegan? I love cheese, and as someone who doesn’t eat much meat, cheese becomes a pretty big source of protein for me. Cheese and peanut butter. There are lots of great cheese alternatives out there, like Daiya, which is one of my faves. But recently, I decided I was going to dive into (what felt like to me) the strange and scary world of vegan cheese making. Turns out, it’s not so scary after all. 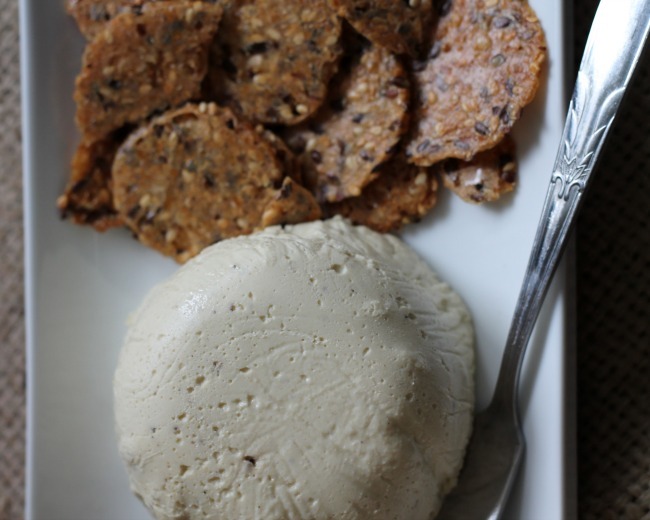 This is one of the easiest vegan cheeses you can make. If I had to compare it to something, I’d say it is most like a cream cheese. It has about the same consistency and spreadability. It lacks the tanginess of a cream cheese, and I don’t know that I’d want to try it in a cheesecake (not a baked one, anyway). I should also mention, this is a raw preparation. I’ve been enjoying this on crackers, but you could also add it to your wraps, enjoy it on a veggie burger, spread it on cucumbers or celery, use it to dip your tortilla chips in… the list goes on. Place the cashews in a large mason jar. Cover with water, place the lid on, and put it in the fridge to soak 4-6 hours or overnight. Drain the water off of the cashews, reserving some of the liquid. Place the cashews, lemon juice, garlic, nutritional yeast, salt and pepper in a blender, and begin blending. Add water, a tablespoon at a time, until you get it to your desired constancy. You may have to scrape down the sides of the blender a few times. Spoon the finished cheese into ramekins that have been lined with saran wrap, and refrigerate. When ready to serve, peel back the top of the saran wrap, and flip the cheese over onto a plate. Peel off the saran and enjoy.